This planthopper is about 5 mm long. It is sitting on the underside of a Canyon Ragweed (Ambrosia ambrosioides) leaf. Mazatzal Mountains, Maricopa County, Arizona, USA August 24, 2008. This is an adult as evidenced by fully developed wings. Immature stages look similar except that the wings may appear as buds or be hard to see at all. Identification of the various species requires some expertise. This one was kindly identified by Andy Hamilton, a Canadian Entomologist. This plant hopper looks superficially like a small moth. The wings, held tent-like over the body, are covered with a waxy powder that looks a bit like lepidoptera scales. A lateral view, however, clearly reveals the piercing-sucking mouthparts of a true bug. The third pair of legs are well developed and if disturbed can launch the insect a considerable distance until the wings take over in escaping. 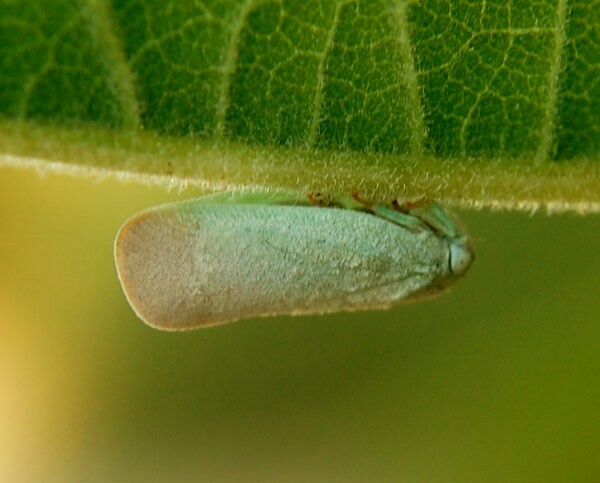 Some species of flatids are pests of crops such as the Citrus Flatid Planthopper. They feed entirely by taking sap in though their straw-like mouth parts.